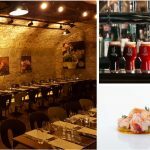 Dublin Docklands dining and microbrewery destination Urban Brewing, located in the CHQ Building, was announced the winner of the Foodie Award category at the 2018 Docklands Business Awards on Thursday the 22nd of November at a ceremony attended by business leaders in the Gibson Hotel. The Foodie Award recognises Urban Brewing’s excellence in Irish food and ambience. 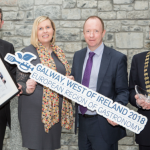 Urban Brewing was presented with the overall 2018 Foodie Award by Declan Coppinger, Marketing Finance Manager at Bord Bia, the sponsor of the Foodie Award category. Urban Brewing is a unique concept and the first of its kind in Dublin, encompassing, over three floors, a fully-functional microbrewery, two quirky Taps + Tapas bars and a 250-seater finer dining restaurant, Stack A Restaurant at Urban Brewing. Innovative food menus emphasise quality Irish ingredients and complement Urban Brewing’s house brews to create a unique dining experience. There were four shortlisted nominees in the Foodie Award category, including the winner Urban Brewing. The awards comprised of twelve categories which attracted more than 150 nominations, which Docklands Business Forum said was the largest ever number and featured the widest spectrum of local enterprises so far to participate in the awards. The judging process was undertaken by a fourteen-member jury who selected the winners at a meeting at Dublin City Council’s Economic Development Office chaired by Greg Swift, Head of Economic Development at Dublin City Council. Representatives from Google, Bank of Ireland, Dublin Port Company, CHQ Building, Smart Docklands, Dublin City Council, BoConcept, Fáilte Ireland, Bord Bia, Aspira, the Local Enterprise Office, Savvi Credit Union and the Chair and CEO of the Docklands Business Forum formed the judging panel. In selecting the Foodie Award winner, the judges look for excellence in Irish food preparation and presentation as well as the ambience within which it is served in order to recognise that cafés, bars, restaurants and hotels give colour to the streetscapes in Dublin Docklands and taste to our lives. Urban Brewing is located at Vault C, CHQ Building, Custom House Quay, IFSC, Dublin 1. To find out more, see the official website at www.urbanbrewing.ie and stay up-to-date on Facebook, Instagram and Twitter@ubrewingdublin.